Levi was the king of the scoot-bike. He would shred neighborhood sidewalks and the skate park at a nearby school. But until last month, pedal-equipped bikes eluded my 4-year-old son. Enter the Strider 14x. A new take on built-for-kids bikes, the Strider 14x is more than an upgrade; its design is a solid leap ahead. See details in our review of the Strider below. We got an early-release bike from Strider a month ago. Since then, Levi and other little testers have put it through a thorough review. The bike goes on sale today for $210 MSRP ($199.99 on Amazon, with free shipping). 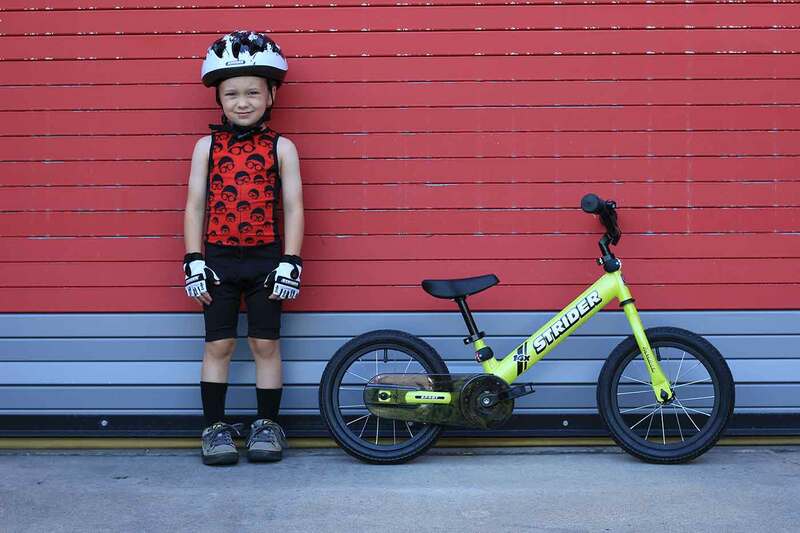 Strider touts the 14x as “the only first bike your child needs.” That “only first” clause nods at its selling point of doing double duty as a balance bike and a mini pedal-equipped ride. The company has long been a standard in the category of the scoot/balance bike. My kids all learned to balance and coast on these kinds of bikes, and none of them needed training wheels when it came time to try pedals. A new design, the 14x gives both options: A kid can learn to balance and steer without pedals. Then, once ready, a parent attaches the pedals, gears, and chain. It’s an easy add-on. Strider ships the drivetrain as a kit, pieced together and ready for attachment with a single bolt. It mounts in the place of a removable footrest that comes stock on the bike. Seat and handlebar heights adjust to accommodate kids from age 3 and up. A chain guard is standard, giving a shield to prevent kids contacting the moving parts or smudging grease on their leg. My son was eager as well. Seeing his older siblings pedal ahead on bike rides was a frustration. He was ready to catch up. The 14x bike has a steel frame and namesake 14-inch wheels. It weighs about 12 pounds in balance-bike mode, and about 15 pounds with the pedals on. The weight of the bike is less than much of the competition. But Levi still struggled to push the 14x up hills or lift it over obstacles. He weighs about 40 pounds, so for little guys even a reduced-weight bike like this can be a lug. But once pedaling there are no issues. Indeed, the Strider 14x takes the prize as the bike Levi learned to ride on. He’d been dabbling with larger pedal bikes with no luck. But after just 20 minutes playing on the Strider he was pedaling down our sidewalk, smiling and free. A key advantage in the design is that a kid can continue to scoot—or choose to pedal—at any moment. The design of the bike, with its narrow pedals, allowed Levi to kick and push off with his feet to coast ahead. Then, with some verbal instruction—“get your feet on the pedals!”—he started to spin. With his balance down from a full summer of cruising on pedal-less bikes, the main thing to learn was the motion of pedaling. Well, that and braking. This bike has coaster brakes; move the pedals backward and they lock up the rear wheel. To be sure, it’s a strong stopping mechanism. Right now, Levi relishes in locking the brakes and skidding on our sidewalk, sometimes leaving the trace of rubber tread in a streak when he brakes at full speed. Beyond the pedals, the bike has a low center of gravity. 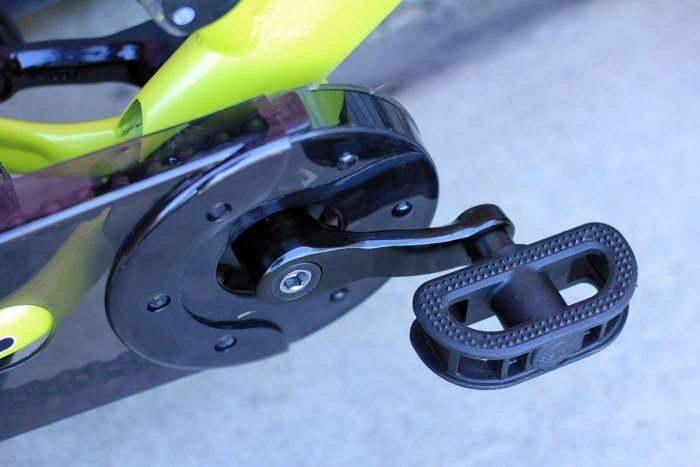 The handlebars, with 22mm grips, are easy to hold and give control. Overall, the design is built to perfectly fit a small frame. The seat was designed for a 3- to 7-year-old body, Strider cites. And while it’s padded for some comfort, it encourages an upright riding position with appropriate posture. Levi takes off on his first pedal-powered ride! My boy is comfortable and confident on the 14x, and I feel safe as a parent letting him cruise the sidewalks down our street. The 14-inch wheels are about the perfect size, not too big or small. The drivetrain, with a 28-tooth chainring and 16-tooth rear cog, give good speed but also are easy enough to pedal for small kids heading up hills. Levi now stores his Strider under a tree in the yard. It’s at the ready to ride whenever he heads out to play. The pedals give him the confidence (and speed) to keep up with his brothers or rocket ahead to a friend’s house down the street. I expect him to ride this bike for the next couple years. It’s adaptable enough to fit his growing frame, and the style—single-speed with do-all tires and a decent gear ratio for speed—will not be quick to outgrow. Overall, Strider has done a nice job with this next-generation kid bike. I have long recommended parents look to balance bikes before choosing pedals. Now with this adaptable option on the market, you can get two bikes in one. –See more info on the Strider 14x at Striderbikes.com. It goes on sale today for $199.99 on Amazon, with free shipping.